A University of Southern Maine installation art project in Portland designed to draw attention to sea level rise predicted by scientists. PORTLAND, Maine - Students at the University of Southern Maine have unveiled an installation art project in downtown Portland designed to spark debate that goes beyond the world of art. It comes in the form of a public trail, and aims to help people visualize the future impacts of the rising ocean. Tom Porter reports on an art installation in Portland aimed at raising awareness of rising sea levels. 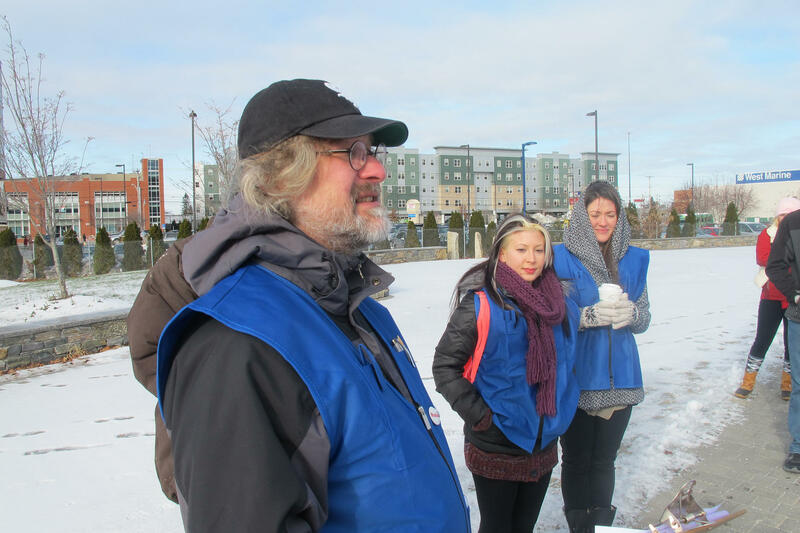 On a frozen patch of open ground not far from Portland's Back Cove, a small group of people - most of them art students at USM - braved freezing temperatures and biting winds to launch a project that's been a semester in the making. "Today is the official opening of the King Tides Trail, which is a cycling and walking trail, going from Elm and Somerset street all the along the Portland trails into the Old Port," says USM Art Professor Jan Piribeck. Piribeck says it's meant to help people picture what downtown Portland could look like by the end of the 21st century - or sooner - if sea level rise continues as projected. "We want to bring attention to what's really going on," Piribeck says. USM senior Amber Desrosiers is one of the 14 students involved in putting together the King Tides Trail, which stretches for just over four miles. On either side are thousands of red tassels attached to nails, which have been hammered into the ground. They mark where a high tide - or "King tide" - could reach by the year 2100, if the sea level rises an additional three feet, as many scientists are anticipating. USM graduate student Ken Gross at the unveiling of the art installation aimed at calling attention to rising sea levels. Other parts of the trails are marked by informational observation points, solar lamps or wooden posts, says graduate student Ken Gross. "Really, much of the work took place in the lab back in Gorham, and what we had to do was figure out where the line would fall assuming sea level rise," Gross says. And this involved working with state geologists and experts at USM's own Geoscience Department, using GPS technology, inundation maps and other data. This educational installation is part of the wider Gulf of Maine King Tides Project - a cross-border initiative looking at sea level rise, including agencies from Nova Scotia and New Brunswick in Canada, as well as Maine, Massachusetts and New Hampshire. With the King Tides Trail now formally unveiled, it was time for the inaugural hike. "I think that artists have something to contribute because we are in the habit of making things visible that are sometimes invisible," says Professor Piribeck. Piribeck says art has the potential to add more to a scientific debate than just technical data or charts, "which are good and important, but sometimes they don't really communicate to people on a visceral level." The King Tides Trail installation project will be on display until Jan. 23. Learn more about the Gulf of Maine King Tides Project. Learn more about the Gulf of Maine Council Climate Network. View the King Tides Trail on Google Maps. Learn More about Envisioning Change.